AVAILABLE EXCLUSIVELY FROM MILL AMUSEMENT, LLC. SUPPLIES ARE EXTREMELY LIMITED--ONCE THEY'RE GONE; THEY'RE GONE FOREVER! Sadly, GameRoom Magazine ceased publication with the October, 2010 issue, after 22 years of publication. Founded by Dave Cooper in January, 1989; Tim Ferrante took over as Publisher and Editor when Dave Cooper unexpectedly passed away in 1996. Kevin Steele became the Publisher/Editor beginning with the January, 2006 issue, and took the magazine to amazing new heights with full color glossy paper and lots of new articles and monthly features. Each issue of GameRoom Magazine provides hours of interesting, informative reading with great articles about pinball machines, videos, slots, jukes, Coca-Cola items, repairs and restorations, how-to articles, collectibles, arcades and all manner of items for your home game room--as it says right on the cover, "Your Guide to the Ultimate Home Game Room." Mill Amusement has acquired the entire remaining inventory of GameRoom Magazine back issues, and is now making them available to collectors and pinball enthusiasts. Fill in the missing gaps in your collection before they're gone! Or just try a sampler to see what you've been missing. INVENTORY OF ISSUES AVAILABLE--QUANTITIES ARE VERY LIMITED! Each issue of GameRoom Magazine comes individually packaged in a collector-quality, heavy-duty plastic 4-mil re-closable bag for long term preservation. Each issue is near mint, never labeled or mailed, stored in a dry climate-controlled area. 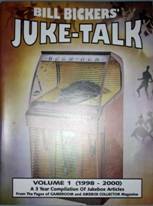 A great resource if you're into old jukeboxes. This is a 3-year compilation of Mr. Bickers' magazine articles which first appeared in GameRoom Magazine and Jukebox Collector Magazine between the years 1998 and 2000. 37 different articles. Individually packaged in a heavy-duty collector-quality 4-mil plastic re-closable bag for long term preservation. Near mint condition; never issued. 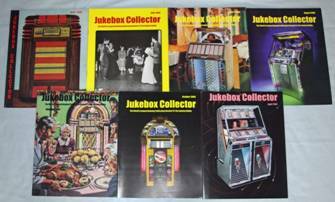 JUKEBOX COLLECTOR MAGAZINE This 7-issue set is comprised of near mint condition back issues which were never mailed. Each issue is individually packaged in a collector-quality, heavy-duty plastic 4-mil re-closable bag for long term preservation. Individual Issues EXTREMELY LIMITED SUPPLY! PayPal, US Postal Money Orders, and your personal check (held until cleared) accepted for payment. No credit cards accepted at this time. (C) 2008 Mill Amusement, LLC. All Rights Reserved.